WellÂ I have just finished an interesting, exciting different four days with regular client and good mate Phil norman and his four mates from Brisbane.Â Guiding this number of menÂ is never easy and just organizing the day can take some time but with themÂ split up most days between Phil and myself we managed to have some good laughs and nailed a few really good trout on the Hine and the Tongariro. Three of theseÂ men had not fished before and the actual fishing bit was a distraction to the boys weekend away but they all went home able to say that they had caught their first New Zealand trout on the fly. 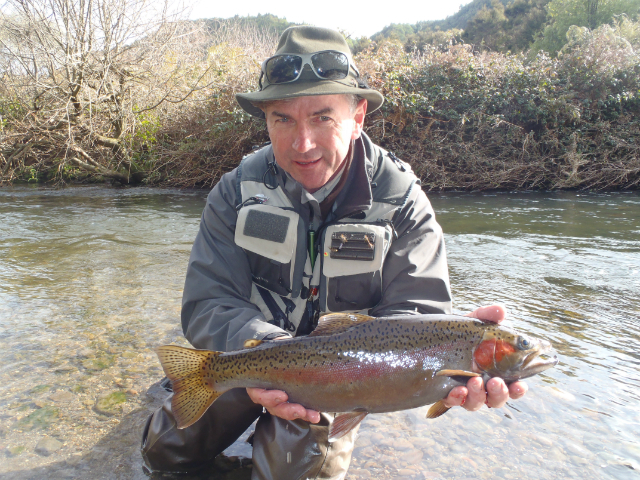 The Hine again producing some great fish and plenty of them for most able anglers. This river has been the best this season but it seems every angler in NZ has heard that the fishery has improved and fishing pressure is as heavy as I have seen it in 8 years!! 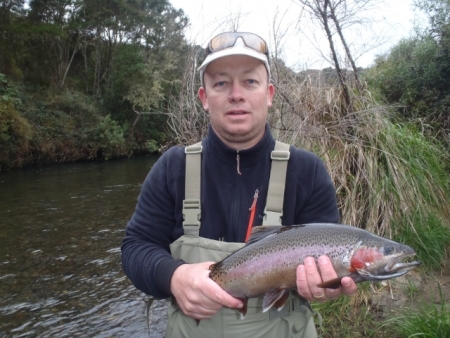 This poor little riverÂ is getting a pounding at the moment and it wont end until the fish stop running hereÂ then most anglers will head back to the ever faithful Tongariro. The fish in the Hine currently is a mixed bag Â with more than half of them being well and truly into spawning mode with the odd silver fish mixed in them. The lower reaches are still receiving small runs most nights and the little bit of rain we are gettingÂ at the moment should push a few along. With so much pressure on the HineÂ I do worry about some of our best spawning fish but I’m sure the department know what they’re doing. On Saturday I rafted with the 5 boys from the Blue Pool right down to Judges and counted 103 anglers scattered on every availableÂ bend on the river, I have never seen it so busy but am assured that the “good old days used to be like that”. The Hydro had 13 anglers in it alone??? I suppose the river could have had 150 on it if you were to count what was below the bridge and above the Blue pool.Â We had a very mixed day with fish numbers and generally found the fishing to be disappointing compared to other days. It was not surprising to have a quiet time over the weekend on the Tongariro simply due to the amount of fisherman flogging the river to a foam. We actually did really well in the first pool of the day with the cover of cloud and being the first through but as soon as the sun came out and the fisherman arrived things went fairly quiet. I think for the day we got 5 in the boulder pool, 2 in the lower Birch’s and one in Boulder Reach. This is really positive for the fishery and it shows websites and magazines are being looked at and believed by anglers. Unfortunately with no rain andÂ bright conditions mixed with heavy fishing pressure there would have been alot of anglers heading home skunked for the day or even weekend. 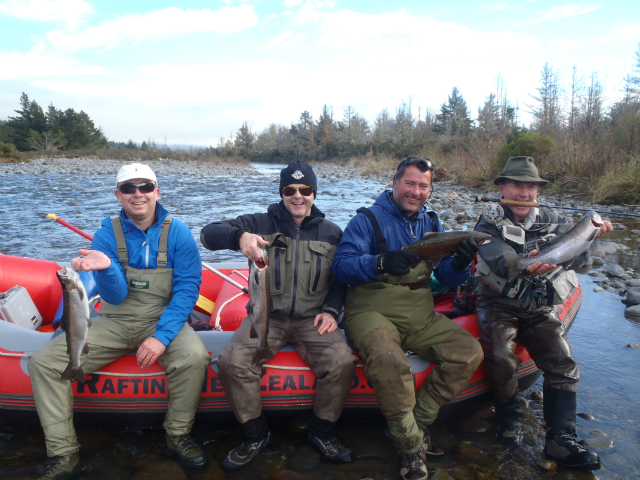 As you can see from the photo’s the boys had a great time on the raft on a stunning winters day here in Turangi and thankfully forgot about the lack of trout. Rafting is a very relaxing way to see the river and to get at spots which the old or achy body wont take you too any longer. We were actually very lucky to have the use of the raft so I could find some water out of the wayÂ for these guys to fish. A fish worth talking about was a beauty jack caught in the Hine last Thursday by one of the group Phil Dacousi while nymphing a small Quasimodo in the riffles. This fish weighed just over 6lb and was a great looking trout which gave Phil the fight of his life after stumbling through two rapids. 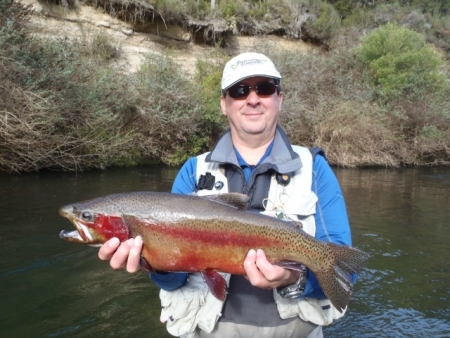 As you can see itÂ is quite coloured with spawning stripes which looks quite impressive when comparing it to fresh silver fish. The fish was sporting a few battle scars including a very damaged bottom lip which would have been from fighting and eating Koura in the lake which would have played a big part in why this fish is so solid. All in allÂ a very enjoyable four days and a pleasure to be involved with these very interesting guys. I will be again out all day tomorrow so should report back with some new material nearing the end of the week.